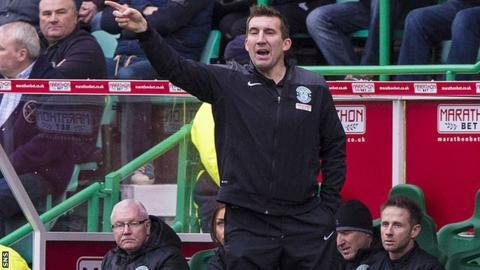 Alan Stubbs believes his Hibernian side can end a huge week for the club by beating Edinburgh rivals Hearts. Hibs, who hammered Rangers 4-0 on Saturday and revealed plans to move towards fan ownership on Monday, visit the Championship leaders on Saturday. "Hearts have had a fantastic start to the season and are rightly where they are, but we feel as if we are a match for them," Stubbs told BBC Scotland. "We'll to have a good go, the players' confidence is at an all-time high." Hearts are 15 points clear of Rangers in the table, with Hibs four points further back in third. Stubbs' side lost 2-1 at Tynecastle in August and the teams drew 1-1 at Easter Road in October in their previous meetings this season. "We're hoping we can end the week like we started the week," added Stubbs. "It's going to be a great game, derbies always are. "In both of the games [against Hearts] we could have won. There have been factors in the games that have not gone our way, but we're not going to feel sorry for ourselves. "I hope it's going to be a right good game of football where two teams are going to go at it and the best team comes out on top at the end of the day. "They have been very good and the reason why they have got a commanding lead is because of that, so we know it's going to be tough and we have to raise our performance level even greater from the Rangers game to get a result. "Hearts and Robbie [Neilson, manager] will know they have to raise their game as well against us. It's two really good teams who are in good form, and I'm hoping it's going to be spoken about for football reasons rather than any other reasons." Saturday's home win over Rangers provided a huge boost for the Easter Road outfit, and Stubbs revealed hearing the fans' rendition of The Proclaimers song they have adopted as their own was a special moment. "I'd heard about 'Sunshine on Leith' quite a lot of times and the only experience I've had of it was by listening to it on the internet," the Englishman added. "To hear it at the end of the game, and for the players to hear it, I thought it was fantastic. Put the result aside, I thought that was the most significant moment of the whole of Saturday. "I'd probably say that is the first time I really felt what a really great club this is. I was delighted with the team on Saturday, in fact I've been delighted with the team since I came in, but the most poignant moment for me on Saturday was the fans at the end of the game."